Overall great experience, very friendly staff! Super friendly staff, great place to rent. I would rent again in a heartbeat if I ever need to. Thank you for being here for us.Great staff and great property! Sheila and Tom always addressed my needs. Always excellent & helped me in every way possible. Wonderful folks. Sheila has outstanding customer service. I will refer here , just because of her ! This place was amazing. Great staff always there to help . Love the friendliness that they give. Love Sheila and Tom, they make us feel welcome . They have a great reputation for being the best storage place . I would refer a friend 100% to this place. Thanks for the years of storage with you. I will refer my friends. The service here can't be beat ! I would rent again in the future , it's clean and safe. This is a great storage facility- Thank you for your kindness and friendly service. This place rocks! Nicest Staff ever! It was fun, clean, and safe . Thank you I appreciate you all ! I love you Sheila...Very nice lady! Sheila was very accomodating and friendly. I will refer my friends. Thank you for the amazing services! Sheila is the BEST ! Thank you--- It was a pleasure. Thank you very much for the awesome service, my friend Gordon referred me, and I am glad he did! This was a great storage unit for a great price. Thank you Tom and Sheila and it was great meeting you, such quality people in a world that greatly needs it! I feel very welcome, thank you! This facility is run very professionally and personally- Thank you for everything. The nicest management I have ever dealt with. Very professional, personable, felt like family. Almost sorry to go! After 5 years ! Sheila was wonderful . Great overall experience, perfect location, good prices, nice service. Thank you and I will refer. Sheila is the best! Thank you so much for everything! See you soon at Red Robin ! The staff here is remarkable. The property is clean & secure - Thank you! I will be back ! Thanks for everything! Great place! THe managers are great & helpful. The staff here is very courteous, friendly, and willingness to help. Very Good people to work with-- Thank you for everything! A pleasure doing business with you . I had my RV here-- grat access and wonderful staff- I will be back . Awesome service and great facility. By far the Best storage facility I've ever used, Friendly staff and secure facility . Excellent service and clean property. Great customer service and friendly! Very helpful for our first time renting a unit. I will refer! The owners were very friendly. The storage facility was very clean. Anything I needed they were there to help out with. It's been a pleasure renting from your facility.Thank you for being so kind! Staff was wonderful and extremely nice and friendly. Awesome experience!!! Thank you Sheila and Tom!!! ** Great customer service, super personal and professional. You will love them. Will be back again! Sheila was excellent to work with. She was helpful on the move in and helped us to purchase two more units. We will rent again more in the future. You guys are good.. I will return in the future ! It has been an absolute pleasure working with Sheila & Tom. They have always been helpful& I am SAD to leave. Thank you for being so kind! I will rent here again! Sheila is just the best! Such a caring and wonderful woman! Absolutely friendly staff. Easy to get in and out really fast. I would definitely rent here again. Fantastic experience with family like feel, I highly recommend and will tell family & friends. Thank you! I will refer! Would recommend this storage place to anyone. The staff is super friendly and helpful. Friendly service at a safe location! I highly recommend! Thank you ___ Great Service !! Great service . I will refer. 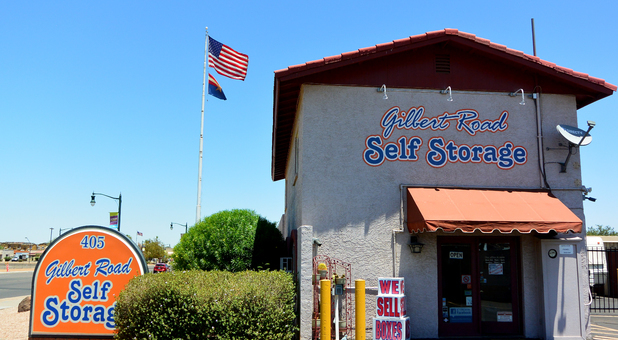 Gilbert Road Self Storage was the easiest place to rent from. The staff was very helpful all the time!! I would rent again in a minute . Thank you. Friendly staff, great hours, close to our home. Sheila and Tom are great! We would absolutely come back and store with them again. Thanks! Thank you for being so kind and patient. Wonderful place. The staff is top notch and I would refer them. We will return if we ever need a storage unit!! Excellent service!! Great service, fast and clean storage units.. Awesome friendly staff, helpful and love the easy access. You guys were fantastic , would rent again. I had such a great experience working with the folks at Gilbert Road Self Storage. Thank you . Great customer service. I rented here for years and I will be back if I ever need a unit again. I appreciated the way you handled our account here. You guys are awesome. I would recommend this storage facility to anyone . I chose this location because of past great experience and great reputation. It did not disappoint. Th Hogues are very special. Great customer service and friendly! Very helpful for our first time renting a unit. I will refer. Very friendly and concerned. Prompt on calling on any security issues. I would rent here again and I will refer my friends and family. Gate access going in and out, makes me feel safe and secure. Everyone here watched for everyone else. Thank you for being great! Excellent Facility. Friendly staff-always willing to help. Sheila is MARVELOUS!! Awesome customer service, everything easy and practical. Thank You! Best storage place I have used! Very nice, clean facility & staff was wonderful, especially Sheila & Corey. This is my second time that I rent a storage here. And if I need to rent again, I'll be back. Thanks Sheila. I'll miss you. Tom and Sheila were the greatest. Friendly, treats you like family & I would recommend them highly. They can't be beat. Thank you. Great staff. Always smiles . Sheila and he husband are awesome. They are both very personable and caring people. Even when I was late with the payment she was always understanding. Thank you both. Sometimes hard to get past RV aisle- when people are offloading boats, skis etc., But love the managers , they work hard for us! Friendly and helpful. Sheila is the best !! Sheila and Tom are so helpful and courteous. I recommend this self storage to anyone. I was referred to you guys! Thank you! I will refer! I couldn't have chosen a better place to rent from. The office staff here is the best. I will return if I ever need storage again. Great Service! I will refer! It has been a pleasure knowing the staff. My wife and I were customers here for roughly four years. Sheila is awesome to work with and the location is great. It has the feel of a family run business because it is. The units are safe, protected well, and access is easy. They do get quite dusty but if you pack correctly all will be well. I enjoyed giving them my business. Great facility and managers! Super clean and they make you feel right at home! Stop in and talk to Sheila or Tom they will help you with anything you may need. I have rented before and feel confident coming back again. It was so nice to read the reviews and see that Sheila is still running the place. I was able to quickly set a reservation and just received a confirmation call from Sheila. I am comforted by consistent community oriented organizations like this one. I believe you will find the pricing competitive and the staff top notch. The new website is a great asset. I highly recommend Gilbert Road Self Storage. This is the first time I have ever had to store my belongings and I am very happy with my choice! Sheila was amazing and I could not have asked for better customer service! I would recommend this place to anyone who needs storage. The facilities are very clean and well kept. I had no problems with dust and insects whatsoever. Tom & Sheila are incredible people and do a great job serving the community with Gilbert Road Self Storage. They operate with total integrity and are the best in the business. I would HIGHLY recommend them to anyone in need of their services. I LOVE Sheila she was so helpful, nice and AMAZING! Gilbert Road Self Storage met all of my needs in a storage facility. The staff was very friendly and always helpful. Thank you for the great service. Everybody was very friendly. The people are friendly and the place looks great! Convenient, Personel very good and friendly. Everything Good! It was Great !! Thank you all! Great Staff!!! Friendly & professional. I will refer to my friends. Tom & Sheila are always very helpful & lend a helping hand when needed. From the time I walked into the door , I was welcomed! What a wonderful staff you have here! Thank you for all your help in my time of absolute insanity! Thanks again and I will be referring my family and friends. Thank you! I was referred by my daughter. Great Place. Great People. This is the best storage place I have EVER been to. It's really nice to know that there are people who care about you and want to hear your story! Thanks again! awesome staff, friendly & always working with me. I had a great experience with gilbert road self storage. Great staff. Staff is amazing, they are friendly, quick,and answer any question that we had. Communication is an A+. I will be returning and recommending family and friends. Good Experience- worked out for me. Nice people in the office. After 3 years here , I must say , the service here is superb! Tom & Sheila have been here for any questions and helped through a couple of situations with me. Thanks again and I will be back! Great service. Sheila worked with me and i'll miss her very much. This place has been great to me! Very happy to have rented here. Sheila & Tom are AWESOME!! I was always contacted before I would ever go late and they would let me know and help me avoid my fee. Loved my stay. You guys are awesome! Very easy to work with! Sheila is awesome!!! We just rented here and we couldn't be happier!!! I always recommend this place - I have used it 3 times - the people in the office are the best! Excellent service, clean and organized. Tom & Sheila are awesome! Great service! Great people! Thank you! Sheila very customer friendly. Over 3 years here tells you we had know complaints. Thanks to you all!!!!! Tom and Sheila are awesome!. They helped me find the best unit for my moving truck. I had no idea what size to pick and didn't want to spend more than I needed to. The unit size fit my moving truck perfectly! They were so kind and stayed past their normal hours just to help me find the right unit. I was in the military for 4 years active duty and went to many self storage facility's. This one is by far the best I've ever been to. Great people and a great business. Thank you Tom and Sheila! friendly, well coming. Great people in office. I will use this business again, I love em. Thank you for the wonderful greeting when I arrived I needed help with a storage right away and Sheila was more than happy to help me. She made me feel right at home... This place is awesome, I will refer my friends . Third time here!!! Great Staff! Staff is very friendly and eager to help you out! Definitely would rent here again! Awesome service- Thank You ! GIlbert Rd. Self Storage was a great facility & treated us well. Thank you! everything was great, treating me this way had exceeded my expectations. Stay is great. I recommend this for everyone. This was our 3rd time here. It is always very pleasant. Everybody is like family to us. Happy they took care of us. Great staff, very friendly. Always a pleasure to come in and pay my rent. No Issues. I will refer. Great staff, very helpful. I always felt my belongings were safe! I never thought it'd make a difference where I stored my belongings until I came across this place. Very friendly, staff who are always willing to help. I'd recommend them to anyone! I rented a very big unit for my business. Glad I did. Everything was accessible. Thank you for the great service. I will recommend you to all my friends. Very friendly + clean storage facility. I have been back to self-store my things here 3 times, the management is awesome. I love how friendly the staff is when walking in and leaving. The staff was friendly and took care of all my needs. Thank you! Coming to the right place and very friendly staff. We come here every year - our son comes home from college and we use this storage for his extra stuff.. We feel safe, secure, and the managers are always easy to talk to and professional in every way. Thank you. See you in May. We have had a great experience with Gilbert Rd. Self Storage. As a customer here for 9 years we couldn't have asked for a better relationship. Thank you for your kindness and great prices. Sheila is the best!! Would only rent again if she was here! "They were so kind and very helpful. The pricing was very good. They let me know before going in what the total move in cost would be. The place is very nice and secure. I would not go anywhere else." Tom and Shelia are great folks. If i ever need storage i will use them. They make it Hassle FREE. The facility is clean and well kept and security is top notch. Best storage facility I have ever used!! I have been so satisfied with Tom & Sheila for the past 5 years, to the point of becoming life-long friends. I am very happy to know that my 5 years here has been well received and that if I ever need a storage in the future I know right where to come--- Tom and Sheila's Place! All of the staff made my stay very memorable. They were always friendly and worked with me , Always! Always had good service. Managers are friendly and helpful. I would store here again and tell a friend! Great folks do a great job! Sheila is wonderful, always friendly, helpful and sweet.Thank you for everything! The service by the entire staff is awesome ! Gilbert Road Self Storage was clean and friendly. Great place to store my "important" things. I highly recommend this facility. I had such a welcome when I first called this facility. I want to thank them for the wonderful service and for making me feel safe and secure. Tom and Sheila are the best! Feels like family. I shopped around and found unfriendly and unprofessional storages. Then I called here, what a difference! VERY nice, professional and safe place. I will recommend it to everyone I know!!! The staff is great, like a second family! Great people, very friendly and helpful. We had such a great experience having a storage unit at this facility. We moved out of state two years ago and had to leave some items in AZ, and we slowly but surely have emptied it. We downsized units at one point, and Sheila made it so easy for us to coordinate with the movers. We just closed out our unit last Monday, and it couldn't have been an easier process. I will miss Sheila's cheerful calls, but I will be sure to recommend Gilbert Self Storage to anyone who needs a unit. They also store trailers, boats, etc. be sure to call them if you need a Place to store just about anything! Shiela and Tom provide amazing service and great facilities. I recommend this storage company. Excellent customer service and friendly staff. I would rent their storage unit again. They care about us as people, helping to keep our things safe & secure. They are kind and considerate. I would not use any other storage while here in town. Thanks for all that you have done. They were friendly, nice to work with, and I felt safe having my stuff with this storage. I would encourage anyone to call this storage. Great people & found everything as I left it! Perfect. Great place & great service! Moved to closer area, but I like here because it's nice and safe. Will come back anytime! great price, great location, great service... AWESOME management. friendly, took care of business like a best friend! Easy Access to vary safe facility and great service. The staff was always friendly. I liked talking with Sheila when I came into pay my bill. Also location was a big plus. Everyone has been great. Very Friendly place / people. Excellent customer service. Excellent Customer Service! Thanks Sheila. Management team was flexible and fantastic to work for. Excellent staff, facility, and prices! Very happy with the service we received and will definitely be sending business their way. Thank you for everything! All of the staff is super friendly and very helpful. If anything came up with me , they were all very helpful and kind.. Yes I will refer all my friends and family. Great staff, great units, great prices, great location! There are not enough good things to say about Gilbert Road Self Storage. They have the friendliest staff who are always available and happy to answer any of your questions, they have a wide range of available storage units at affordable prices that are well taken care of, their location is convenient and in a good area, and you can rest easy knowing your personal belongings and keepsakes will be kept safe and secured. Great people. Great Service. Thank you. Great Service. Personal attention & good customer service. Thank you. Extremely friendly staff- Great facility! It was a great place to rent from and the people were great! I been coming to here to rent a storage everytime when I moved. I like this place. I never had no problem at all. I love it! Best place. I alway tell my friend to go here. I Love this place it is my 3rd time coming back. They keep my stuff safe. Storage is so clean and safe I love the worker there. Their very kind and such a sweet heart. I went to other storage place before I had break in my kids stuff got stolen at u-haul worst place but here at self storage is the best place. I will definantly come back and refered everyone I know. Everyone was always helpful. Called me even when I left my unit unlocked. Great people! So nice! Will come back if needed. Bad gate key pads (lol). Great experience! Friendly staff. Would rent again! The Unit was Perfect For Our Needs. Very Satisfied! If I ever need storage again I would be coming back here. The service is great & I had absolutely no problems. I refer all my friends. LOVED IT! Second time here-- I will be back. Everyone has been great and helpful. Will use again if the need arises. We felt out motorcycle and misc items were very safe here. Always friendly staff and helpful. Super nice staff who is always willing to help! I will refer my friends!! Very Friendly & outstanding service! Tom & Sheila are awesome! Butch is a very friendly and good fill in! Thanks All! Thanks Sheila!! If I ever need storage again you're at the top of the List! FRIENDLY PEOPLE AND NEVER ANY ISSUES. Convienient hours and a very helpful staff. Thanks a lot, u guys were great. Was what I needed and people were friendly. Easy Access & great staff. Pricing was very competitive. Staff are friendly and work with you to make accommodation and help whenever they are able. Overall excellent. It was Great!!!! Thank you Sheila! We felt our items in storage were secure which provided us peace of mind. Thanks. Thank you for great service for almost 10 years. All 3 of my units were safe + the office staff very professional. I will return if I ever have another need for storage. I will refer Gilbert Road Self Storage. You are amazing! Sheila + Tom are so friendly + on top of everything. The unit was clean when we moved in, and they were super helpful. Staff was wonderful and facility was clean and convenient. The staff was awesome and the units are super clean! I would definitely rent from them again! Great facility, no worries, no hassle. Would rent another unit. Friendly Service. Fast and convenient. Sheila goes above & beyond with customer, wants and needs. Property is very well taken care of. It was good. I had no issues. The staff was helpful and informative. The unit and grounds were kept clean and neat. I would definately use Gilbert Road Self Storage again. Sheila and her husband are awesome, friendly & great people! Everything was GREAT. Management was friendly, helpful and great. Sheila was always very friendly and I felt that my furniture was always same and sound. Thanks! SO FAR, THIS HAS BEEN THE BEST BUSINESS THAT I'VE DEALT WITH IN AZ. SHEILA, THANKS VERY MUCH. Sheila is awesome, so friendly. This is the best place ever! We love Sheila and Tom and they are always very helpful and fun! Safe and easily accessible. Fast, easy, would rent here again. Super helpful! THIS PLACE IS AWESOME AND THE STAFF WAS EXTREMELY FRIENDLY AND VERY HELPFUL. THANK YOU!!! Honest, Superb Customer Svc. Refreshingly professional while other places are not! We will return if ever the need. Thanks for everything Sheila. All here have been exceptional and on all levels. Totally refreshing to have the care and quality of service! Thank you! Sheila was fantastic! Sorry I had to leave. Friendly, helpful staff. Everything great! Would use again. Using this storage was a very pleasant experience. Sheila and her staff are extremely helpful & pleasant. People here are very understanding & willing to help if they can. I would always rent storage here, in the future. Storage isn't brain surgery but if it was this place would be a good emergency room! This was my only time to rent a space and it was a good deal because of the top management at the location, SINCE '05. We have been renting from Sheila and Tom for 3 months now, and we love the personalized attention we get from them. They are wonderful people doing a wonderful job. Thank you Sheila and Tom!!!!! Great Staff & Drive up Facility. Clean & Great Rates! Great experience with friendly and helpful staff. Would definitely use this place again! Staff was friendly, helpful & I would use again. Website was great, great overall experience! Available when I needed space, friendly, clean fairly priced. I would recommend a friend. Awesome place with awesome mangers!! I called all Gilbert storages and Gilbert Road Self Storage was the most helpful and friendliest. Others were rude and would not help me. Secure place.. make sure you don't follow anyone in or out... Great security. Nice managers, clean and safe place. Very friendly - Outstanding service - orderly facility and convenient . Great local , service ! I read all the reviews online& my experience has been very good- the reviews are accurate. Staff is friendly & efficient! I will refer to everyone! To whom it my concern. I have had my storage units for about 2 1/2 years now with gilbert road self storage. I was sent to them by family that also has had storage units for years with them. I will be the first to say that I'm not the best at getting bills paid on time but I would like to say thanks to shella and tom for going way out of the way and not just (doing the job). The staff has gone way out of the way to make me fill like family and to make sure that I was not going to miss and or have a late payment. You have helped me in a (no so great time time) for myself and made me fill like family. Not just a numbered unit! I'm happy to say that I made two great friends after I met the staff their. If you are looking to store your belongings, pic's and memories with some one that understands what your stuff means to you than I will recommend that you get with shella or tom at gilbert road self storage. If it was not for the great staff their I might not have all of my memories today so THANKS to shella and tom for going way out of your job outline and helping me!! I would without regret recommend gilbert road self storage to all of my friends and family. Thanks agen and I hope to see you once I'm back in state. THANKS TO SHELLA ,TOM AND STAFF AT GILBERT ROAD SELF STORAGE FOR GOING THE NEXT STEP,HELPING ME IN ROUGH TIMES AND TREATING ME LIKE FAMILY NOT JUST A CUSOMER! SEE YOU SOON!! Daniel Vail. Sheila is always nice & friendly. The Staff is GREAT! Makes the change easy and convenient to do a name change! It was a pleasure doing business with, Butch. Anyone I know who needs a storage unit, I will definitely refer them to Gilbert Road Self Storage. So great and very friendly! 9 years of great service. I like too much rent a storage here . After meeting Tom and Sheila I am certain that anything I store at their facility will be safe and sound. It very apparent these two love and care greatly for the business they built. Seems more important then the kids, yet the biz takes a backseat to the grandkids. I can except that any day! Keep up the great work Sheila and Tom. Nice Place. Safe & Secure. Wonderful management! Will be coming back! I loved my experience while renting from Tom and Sheila. They are very friendly and accomodating. Very enjoyable to rent here. Sheila and Tom great to work with. Appreciate the return call and help to get a storage rental. Sheila, Tom and Butch are the BEST. Friendly and knowledgeable staff. Clean and organized facility. Friendly, convenient, clean, Thank you. I have rented here for several years and I can tell you that Sheila and Tom are the best managers, they are friendly and great to work with. You won't go wrong renting here ! Sheila and Tom are the absolute best. 7yrs. several units. moving out of area. Very friendly and helpful. I felt safe storing my things here. Sheila is the best! Love this place and will rent here again if I need more space. They were so sweet and helpful - just like family ! I'll be staying here. I love it and the service ! I was helped in my time of need. I was offered specials and the workers were very helpful at getting me a unit right away. I loved my reminded call and emails also loved that I could pay without coming in. I felt my stuff was secured here. I would recommend to all. Would rent again if the need arises. Very Friendly, Very organized. Will come back if I ever need to store things again. I am very satisfied with everyone & everything. Sheila runs a fantastic business. She knows everyone and is quick to refer you if you need any help. Don't hesitate to come here! No Problems. Excellent Customer service! Very Clean, neat, and organized facility. The best customer service in town. I will return for any future storage needs. Thank you so much !!! They were a great storage facility, always friendly !! Love your units and Friendly Service. If I move back in the area and in need of a storage unit I will visit you for that service again. Thanks a lot! Very Friendly! Great, Secure Storage! We've been very Happy with the service & friendly staff over the years. They were a Great Storage facility. Always friendly! I really had a great time renting with you. Clean Place and Friendly People ! Butch is very helpful & Friendly. He found the perfect deal for us. The storage units were fine, however paying for this was a huge inconvenience. I had a ton of trouble trying to pay online because when you type in gilbertrdselfstorage.com it redirects the page to a place where your information is not found in their system. Additionally I tried to pay by phone and give the lady my card number, and she simply said "No". So I had to drive down during the middle of my day to make a payment so I could avoid their unforgivable late fee. Once I am through a couple more months I will never rent here again, nor shall I recommend this storage facility to anyone. Very friendly and personal service. I would rent here again. Gilbert Road Self Storage was great. I leased a unit for over two years and never had one problem. The staff is friendly and the facility was always clean and very accessible. I would recommend to anyone! Great facility. Great management. Very nice. Would go back first time I needed. Great owners, just such nice people. Would highly recommend them and if I ever need extra storage I will definitely go back. I could not ask for a better storage facility I have had my stuff in storage there for going on 4 years and have never had in problem's. The staff are very friendly and very helpful . I would recommend this facility it is the best. Clean well maintained it is the BEST. Great managers, clean facility - would store again. Awesome service very helpful,friendly and units are clean. First time using them and would use again and recommend them to anyone. Thanks again for your service! I love this place! I have rented here several times and always find my self coming back. great units and great service. This is the cleanest, safest and most friendly places I have ever been too. Sheila and Tom know how to help you best and make you glad for being there! Simply the best. The friendliest storage facility in the East Valley. Tom & Sheila treat you like family and always offer a fair price. HIGHLY recommended. Absolute Best and Safest place to store you're extra stuff! All the dealings I have had with the management has been nothing short of Professional and Courteous! If it is your first time storing, or you store things often, then you need to come to Gilbert Road, they actually care! Very helpful and freindly. I look forward to using them again.